Earl's Hideaway presents The Kore band. 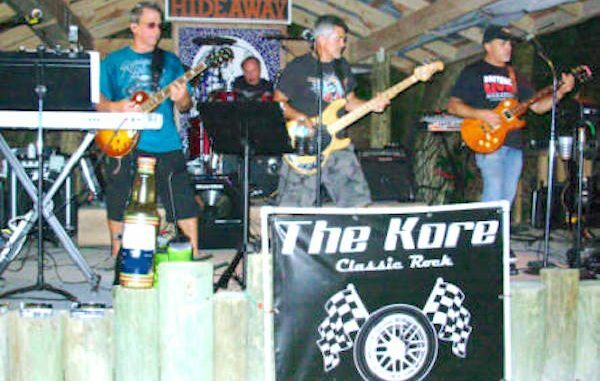 SEBASTIAN – The Kore will be playing this Friday at Earl’s Hideaway in Sebastian. They are a 4-piece classic rock band that’s been performing covers for more than five years. This band is hot, and listening to their Pink Floyd covers sound fantastic. They are a great band to dance to and people enjoy their music. They have entertained music lovers at Squidlips, Lou’s Blues, the Old Fish House, and a variety of places in Melbourne. They have four lead singers who play drums, bass, lead guitar, and keyboards. Some of their favorite classic rock covers are from Led Zeppelin, the Beatles, Deep Purple, Santana, the Rolling Stones, Free, Stevie Ray Vaughan, the Eagles, Aerosmith, Queen, Steve Miller, Prince, Van Halen, and the Who. The Kore band members have extensive experience entertaining audiences, and they do their best to interact with them. They have developed a loyal following of fans in Sebastian and Melbourne. Check them out at Earl’s this Friday from 8:30 p.m. to 12:30 a.m. (January 27).